Review: Becca is a small town girl leaving for college in a few months, but reluctant to leave her boyfriend behind. Amelia Anne just graduated from college and is found murdered and beaten on a road in Becca's town. Told in alternating narratives, we see how the murder is affecting Becca as well as her conflicting feelings about leaving for college and staying behind. 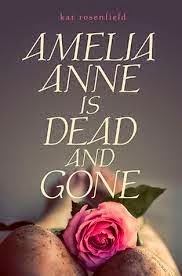 Meanwhile, we follow Amelia Anne as she graduates from college and finds her passion, only to have her life cut short. This was well written and Rosenfield really nailed what it's like to live in a small town. I identified with Becca, especially how she was looking forward to getting out so bad she wasn't able to fully embrace her time there. My town was not as small as Becca's small Maine town, but I 'got' her. While I'm normally a huge fan of alternating narratives, I don't think it worked here because it eliminated the suspense regarding the murderer. The culprit was rather obvious (there was a small twist I didn't expect) but I feel like there could have been more to the mystery aspect. Overall-3 stars. I still enjoyed this one.